A British woman celebrating her 40th birthday has drowned when she and her family plunged into a New York river inside a tourist helicopter. Sonia Marra Nicholson was trapped inside the vehicle for almost two hours after it crash landed and sank to the bottom of the East River, off the coast of Manhattan. Her mother, Harriet, and girlfriend, Helen Tomaski, were in a â€œvery criticalâ€ condition last night after escaping and being pulled unconscious from the water by rescuers. Her 72-year-old father, Paul Nicholson, was stable after being treated at the scene and taken to hospital. He was later released. The groupâ€™s American pilot, Paul Dudley, escaped without injury after swimming to safety. Miss Marra Nicholson lived with Miss Tomaski in Sydney, Australia. Her parents live in Portugal. â€œIt is a sad day,â€ said Mayor Michael Bloomberg, after calling David Cameron to inform him of the accident. â€œAll New Yorkers feel for this family.â€. The group was preparing for a tour of the Manhattan skyline. Mr Dudley, who previously carried out an emergency landing of a light aeroplane, was last night being interviewed by investigators. Witnesses saw the three survivors holding on to the helicopterâ€™s skids and shouting â€œHelp us!â€ as it bobbed in the water soon after taking off from the 34th street Helipad at 3.17pm local time. Miss Marra Nicholson is believed to have become trapped in the back section, possibly by her seatbelt, as the helicopter sank 50ft to the river bed. Mr Dudley, 56, radioed for assistance as he struggled after climbing to about 20-30ft. He attempted to return for an emergency landing but failed and crashed into the water about 40-50 yards out. Witnesses saw the vehicle, a Bell 206 Jet Ranger, enter the water upside down, with its landing gear visible, until the helicopter was submerged. A police anti-terrorist unit and passersby who jumped in began rescuing the survivors. Eight rescue boats, and several police and fire vehicles swiftly followed. One of the women suffered a heart attack and the other stopped breathing. They were taken to Bellevue Hospital nearby. Mr Nicholson was taken to New York University hospital. 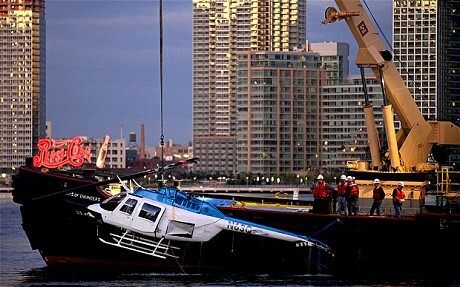 The helicopter was last night removed from the river with a crane by the US Army Corps of Engineers. The vehicle’s blades and doors were hanging off and water was pouring out. It was placed on a truck, to be driven to a location where it will be investigated by officials from the National Transportation Safety Board.